Photos: The new Assembly stop is open! Here are some photos from the opening ceremony yesterday. New Assembly Square station opens Tuesday! The new Orange Line stop is MBTA’s first new rapid-transit station in 27 years. Construction is expected to continue through November, but the stop will be open starting Tuesday. There will be a neighborhood walk and an opening ceremony in the afternoon with Massachusetts Gov. Deval Patrick, MassDOT Secretary Richard A. Davey and local officials. Read the details. An MBTA official confirmed Friday that the new Assembly Square T Station will be welcoming riders to the Assembly Row mixed-use redevelopment site real soon, so they can shop, peruse the Legoland display, and check out an array of eateries, without having to rely on a car to get there. “It will be open to the public within a few weeks,” said T spokesman Joe Pesaturo. Construction of the new Orange Line station at Assembly Square is moving quickly, as the following photos from Wig Zamore show. These were taken in May and June. Click for more. 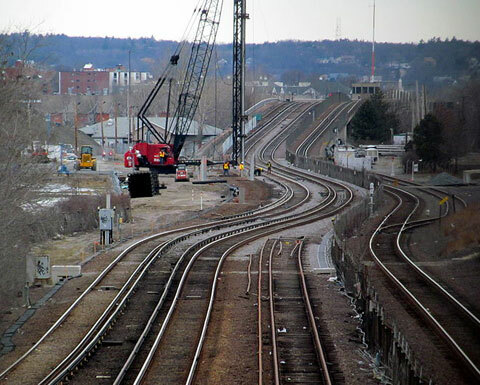 Here’s a recent photo showing the Orange Line tracks temporarily diverted while the station construction gets underway. Construction on the new Assembly Square Orange Line stop, which has already begun, will lead to periodic bus diversions on the subway line beginning in June and lasting until the station is complete in fall of 2014. Download slides from May 23 meeting. Click to view maps of the area and station as well as 3D renderings. You can also download the Nov 2011 MassDOT presentation (PDF). The MBTA has released new renderings of what the Assembly Square station might look like when it opens in the fall of 2014. To learn more, come to the public meeting on Tuesday. To see more images, keep reading. Construction of the new Assembly Square station will impact approximately 200,000 Orange Line riders and an additional one million public transit riders whose travel intersects with the Orange Line each day, according to Wig Zamore, a founding member of Somerville Transportation Equity Partnership (STEP). 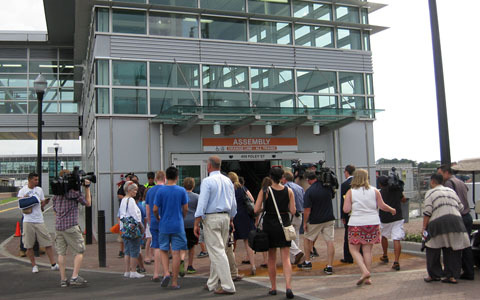 As part of the redevelopment of Assembly Square, Somerville is getting an Orange Line stop. Work on station design continues to ensure good pedestrian and bicycle access. It's expected to open in the fall of 2014.